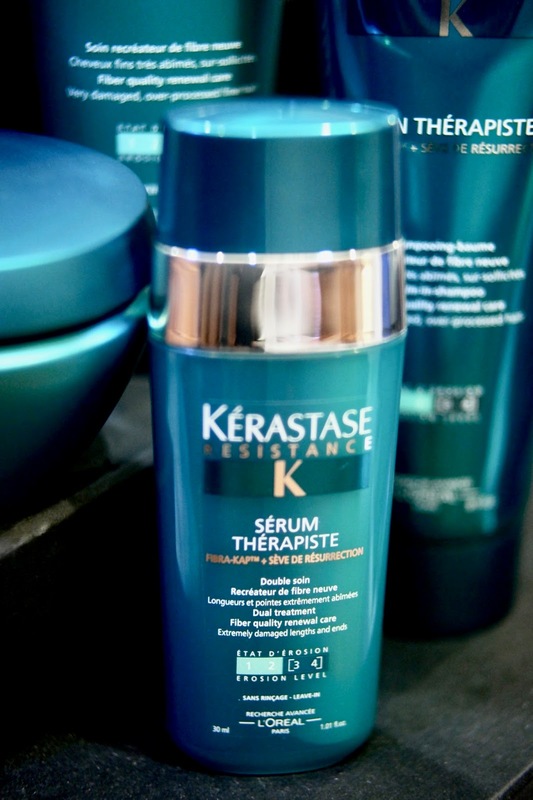 Stephanie Lim: Kérastase Résistance Thérapiste - for unruly damaged hair! Sadly, I have severely damaged hair through years of dyeing my hair, torturing it with styling tools, heck, even blow drying it! So a couple years back, I've decided to nourish my hair, back to its old softer, manageable self. It was like a responsibility, like a pet or a particularly needy plant. I will be washing it ever so carefully, conditioning it religiously, coat it in oils and serums and creams, and hope to God that it doesn’t get any worse but the change was too slow. Products were approached with caution, with ingredients lists carefully examined, and heat tools avoided like the plague. The struggle, as they say, is all too real. 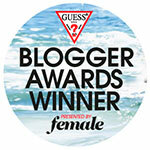 It was inevitable that the amount of damage done was irreversible, till... I found out about Kérastase Résistance Thérapiste! 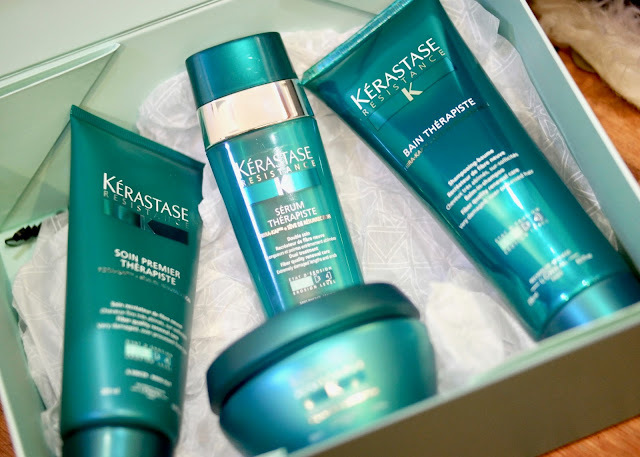 The Kérastase Résistance Thérapiste comes with four products although, highly ambitious, for sure - its technology is groundbreaking, the science behind it convoluted, the claims lofty as anything. The key was that it utilises the sap from the Resurrection Plant, which reactivates the synthesis process and, well, sorta bring dead things back to life. It aims to tackle hair erosion level three and four. The line’s four products are formulated to work on dry, dead hair and the steps on using this range is a tad bit different, too - like, you'll be using the conditioner before the shampoo, to hydrate and detangle hair before you cleanse, with an optional masque for deeper nourishment. However, I will ALWAYS use the mask as for my hair type, it works wonders. It feels weird at first, conditioning my hair before cleansing, but the difference is noticeable. Firstly, least damaged was done throughout the whole cleansing process as there were less force on my mane as less hairs were tangled which is a major noticeable thing if you have crazy amount of hair fall whenever you cleanse your hair. Other than that, my hair feels silky to the touch, and of course after all of it, there was a significant reduction in the amount of hair that collected in the shower drain. For me, the star component is the leave in serum. Sérum Thérapiste is a hair serum like no other. It helped my very-damaged and over-processed hair by repairing the hair fiber instantly, reinforcing it and protecting it against any damages that can occur to your hair while drying! This product is the perfect final step for every hair care as it protect against heat and also adds on an extra dose of softness to my manes mid-lengths and ends. You can apply it on both damp and dry hair. With its additional benefits like high heat protection of up to 230° it also has a diffuser that combines oil-based care with cream-textured top coat. It is also enriched with a breakthrough formula, featuring FIBRA-KAP™. What you'll end up with is a smooth shiny finish and it also makes blow-dry twice faster (depending still on your hair quality). 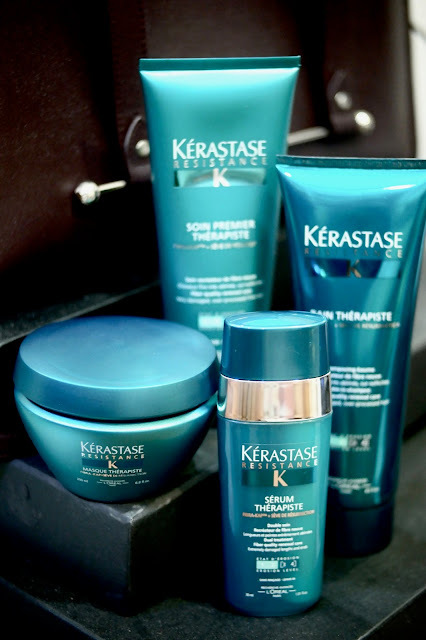 If your hair has really taken a beating, you won’t find anything on the market more effective and more suited to you than the Résistance Therapist collection!